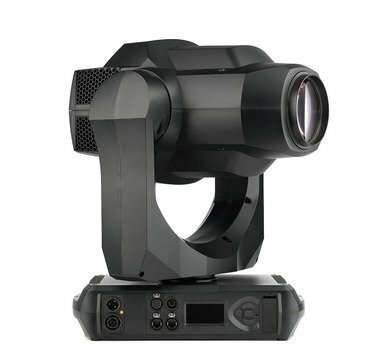 Elation has released its new Artiste Picasso fixture. Designed television and broadcast settings. 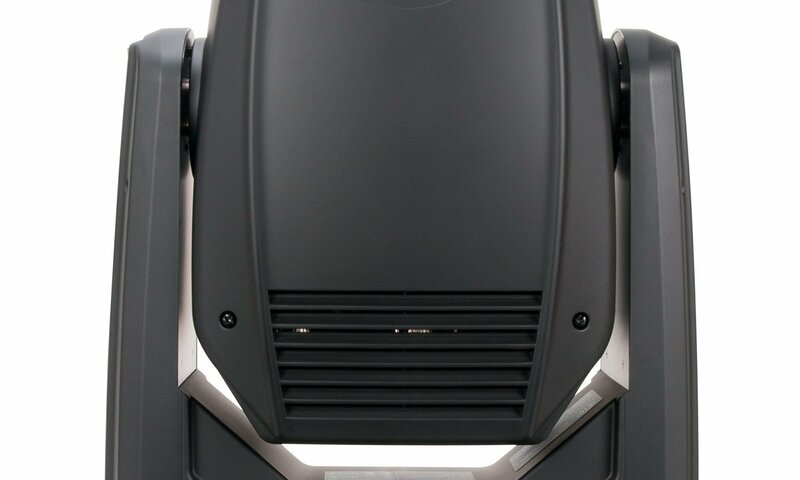 This fixture has a rich feature set which will allow for a wide range of deployment options. This fixture would make a great front light for worship settings. Too expensive to use as an upstage spot for most churches, the Artiste Picasso fixures really have some amazing capabilities and would work great as a DS or Front light key or wash light for those situations where the performers can’t stay put. Check out the Elations Video below. 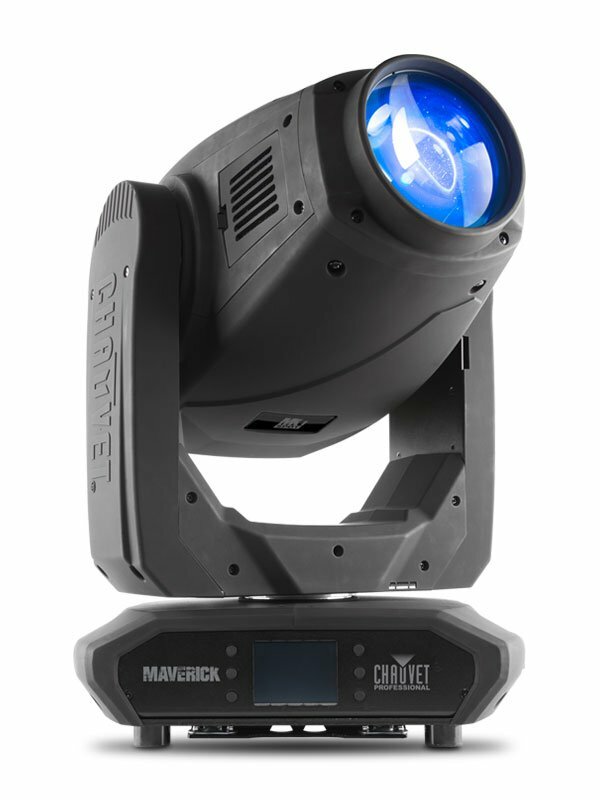 The Artiste Picasso™ is a full-featured innovative theatrical-grade luminaire featuring a new 620W 6,800K Cool White LED engine. With advanced optics that deliver over 23,000 total lumen output and ultra wide and fast 7° to 55° zoom. A full CMY color mixing system producing a full spectrum of shades from pastels to rich saturated colors. As well as a Linear CTO color correction and 6 dichroic colors including a high 87 CRI filter. The Artiste Picasso has 7 rotating/indexing glass and 7 static-stamped metal interchangeable gobos, and 4 rotating full blackout framing blades with +/- 45° individual blade rotation, full 360° bi-directional animation wheel, 4-facet. Also a linear rotating prisms and 2 frost filters, internal color, framing, prism, and frost macros, motorized iris with variable pulse effects, motorized focus and auto-focus feature. With 16-bit pan, tilt, and dimming control, variable dimming curve modes, high-speed electronic shutter, and strobe, adjustable LED refresh rate and gamma brightness for flicker-free operation for TV and FILM. 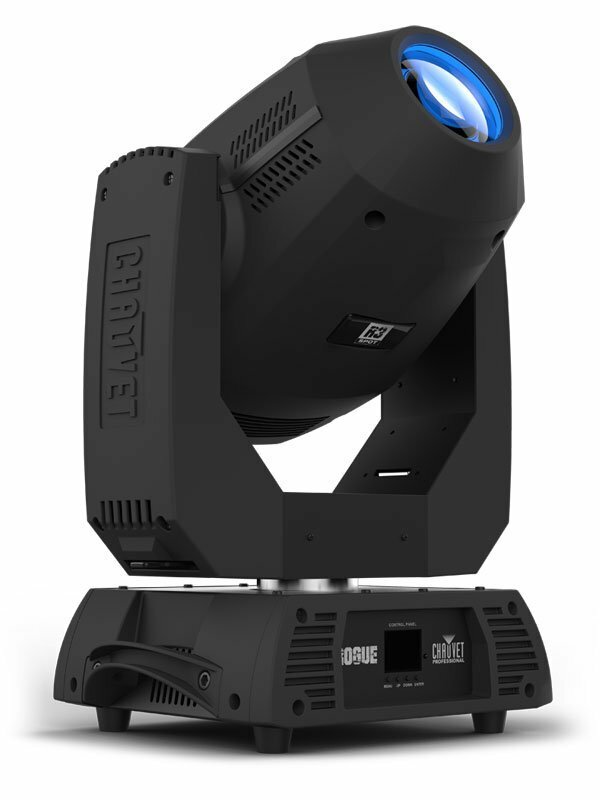 A silent fan mode for noise-sensitive applications, DMX, RDM (Remote Device Management), Art-NET™, and sACN protocol support, Elation’s E-FLY™ internal wireless DMX transceiver, 5pin XLR, RJ45 etherCON, and powerCON TRUE1 connections. A full color 180° reversible LCD control panel, battery backup for display power, and a multi-voltage universal auto-switching power supply (100-240v). 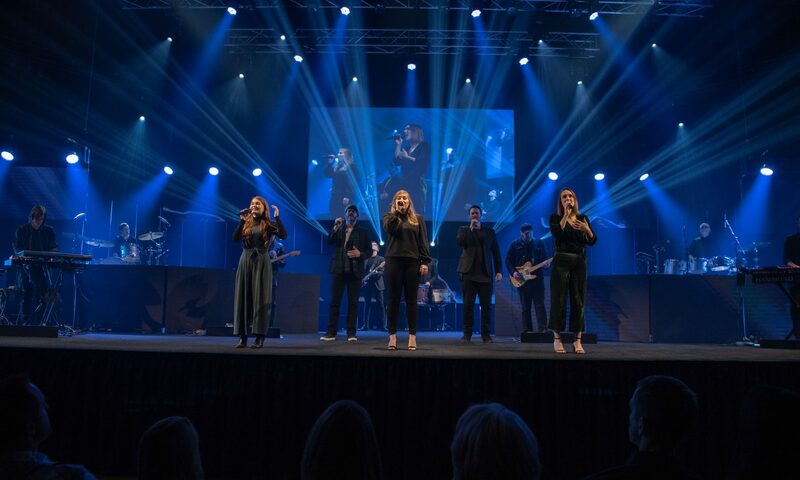 ETC’s ColorSource console family of fixtures seems custom built for a large variety of worship lighting needs. With an easy to use, built in touch screen and onboard tutorials, this is a great desk for first-timers. The ColorSource consoles are incredibility powerful, with the AV versions capable of cued video and audio play back. Which helps to lower the number of volunteers you need on a Sunday. While this lighting console will program moving lights it is not going to be as easy as other desks. Traditionally a theater company ETC’s products are very cross-platform but designed for the theater space. Which sets a very solid foundation for anything you want to design with this kind of system. Feathers like audio and video playback could allow the lighting position to be a complete AV workstation. Video playback would allow for the lighting person to take over some of the control of iMAG slides making it possible for one person to do multiple jobs. With limited church volunteers, this would be a powerful addition to any system. With a simple yet intuitive design these ETC ColorSource consoles are world class at a very attractive price point. But if you plan to use a lot of moving lights I suggest you look for a desk designed to handle those fixtures a little more efficiently. Available in two sizes, ColorSource consoles provide hands-on control designed for the latest technology. 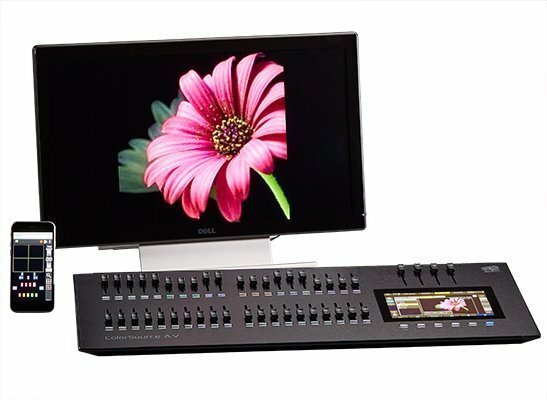 These affordable, portable desks specialize in streamlined, plug-and-play setup; the onboard fixture library makes traditional patching easy, and the console has the ability to recognize RDM-capable devices in the rig and auto-populate them in patch. Simply use the on-board touchscreen to drag each fixture into place on a customizable stage map, and you’ll be programming in minutes. Recording cues or working on the fly, these consoles have you covered. With faders that can be used to play back looks and effects or to mix the perfect color in your LED lights. There are multiple versions of the desk based on what you need to accomplish. 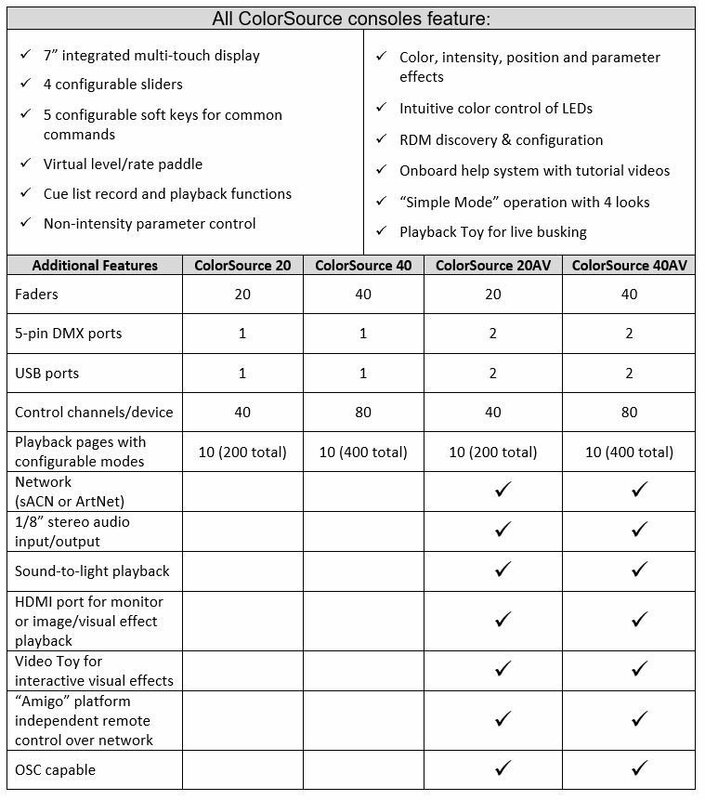 From 20-40 faders and control of 40-80 devices. While I do not see a DMX channel limit they only have two DMX ports which will limit them to 1024. But more importantly, each model has a device model. It is safe to assume that you can not connect 80 moving lights to this desk. You would not want to even if you could. That being said I think I could rock any room with 80 ColorSource fixtures. Go rent this desk today and how you like it before you buy it. I think it would be worth it. 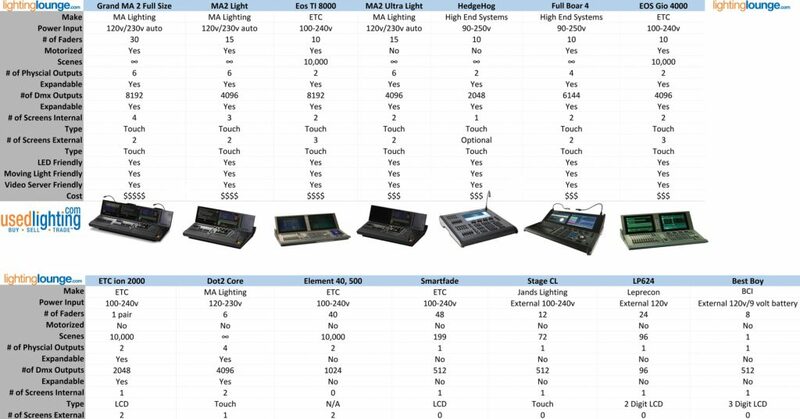 For more info on how to pick out a lighting console check out our buyers guide on the topic.